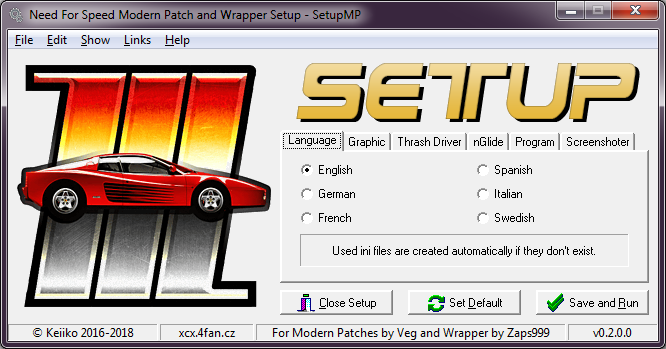 This is a discussion for the topic SetupMP - GUI setup for NFS3/4 Modern Patchs on the board General NFS. nice one Keiiko! so u corrected that negligee thing still? kiddin' .. don't wanna nitpick on that but 'Russian' was also needed here since of our many eastern NFS friends here, wasn't it? 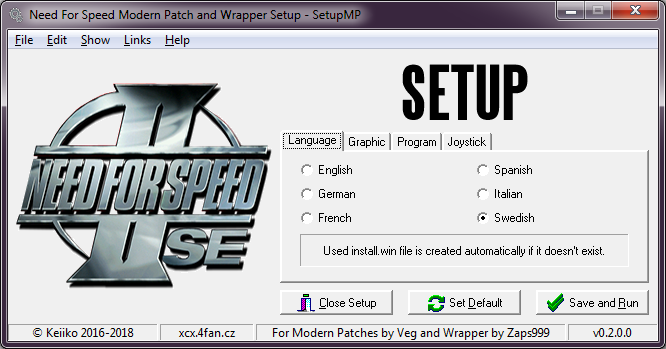 Thank you very much for making Vegs patch even more accessible for eveyone! Definitely increases ergonomics of the Modern Patch. So it will be one tool for both games? Yes, it is one program for both games. I also want to know what Prefer32bitModes and Variant does in nfs4.ini? btw .. where u get the nice large icons from? I only have the small 32x32px ones ..
Made them urself? Cool ..
Btw, do you know which loading screen? One setup for both, okay - will it autodetect the game by nfs3.ini and nfs4.ini? Prefer32bitModes - most likely a setting for color depth (for menu?). Guess Veg has to clarify that himself, since its not mentioned in the readme. Same goes with Variant. For text.CMT and text.MET (both are in english language) - field test: deleted files - NFS runs normally. My guess is, these are some kind of "trash" leftovers, like the plac.viv in Data folder. I know what you mean. The Mixer was planned to be a simple tool to exchange standard tracks, to get other knockout races. I wasn't thinking of adding tracks or cars at all. So it is HERE! For NFS3 and NFS4! I just tested you setupMP and it works fine here on Win 10 64 Bit. I played around with the Trash Driver and other settings. Nice that you have a advanced menu there. Just one thing, it allowed me to set the language to german without having the german speech files. So the game was very silent. Maybe you could add checks for the speech folders and disable the ones not available.